The conjoined California twins that were separated last week following a 17-hour marathon surgery have been reunited for the first time since the operation. Eva and Erika Sandoval have been recovering in separate beds in the same room, but they could not see each other well. On Monday, their parents and intensive care team carefully carried Erika and placed her in Eva's bed to say hello, officials at Lucile Packard Children's Hospital Stanford said Wednesday. It's the closest the twins have been since they were separated on Dec. 6. "It was such a thrill for us to see the girls next to one another again,'' said the twins' mother, Aida Sandoval. Dr. Meghna Patel, who is caring for Erika in the pediatric intensive care unit, said both are doing well. "They have had no significant complications,'' she said. Before surgery, the girls shared a bladder, liver, parts of their digestive system and a third leg. Each girl retains portions of the organs they shared, and each still has one leg. The third limb was used for skin grafts to cover surgical wounds. Both girls would likely need a prosthetic leg, doctors said. 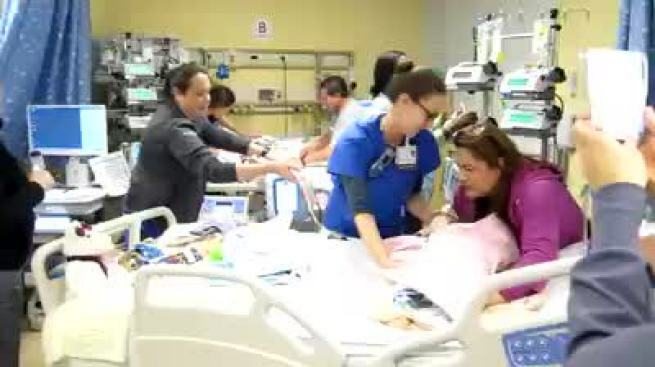 The 2-year-old Sacramento area girls are awake and breathing without ventilators and are expected to continue recovering from surgery in the hospital for another week before moving out of intensive care to an acute care unit. As few as one of every 200,000 births results in conjoined twins. About 50 percent of such twins are born stillborn, and 35 percent survive only one day, according to the University of Maryland Medical Center. Only a few hundred surgeries have been performed successfully to separate conjoined twins. Stanford doctors had calculated a 30 percent chance that one or both twins wouldn't make it through the operation.